For the opening the gallery/atelier invites all guests and friends cordially with live music, snacks and good wine. The vernissage starts on Thursday 27th of November. Actual art works and rare highlight will be presented in the show. Introduction will be held by Kurt Bethge-Krafft. The exhibition runs until January 24th. Finally we are ready! 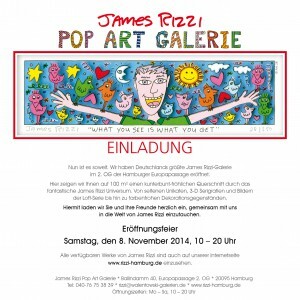 We opened Germany´s first and biggest James Rizzi Gallery in the Europapassage in Hamburg. 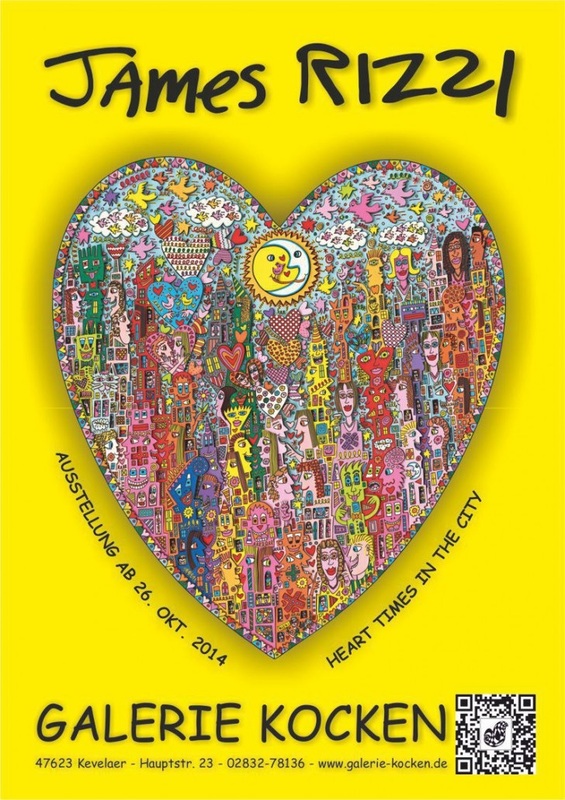 There we present you on 100qm a fantastic overview in the coloured world of James Rizzi. His happiness through his eyes can be admired in each art work, in rare unique pieces, 3D art works, the famous loft series and also decorativ objects. We invite you and your friends cordially for the opening on November 8th. Wuerzburg show three years after the James Rizzi died. fans miss James Rizzi a lot. His uncomplicated and happy way of life is for us today what James Rizzi will be forever. After his death the galler Gabriele Müller in Wuerzburg presents a show with fanstastic memory pieces, new 3D art works and some highlights. From Saturday 15th of November until 15th of December the exhibition runs in the centre of Wuerzburg. Come and visit one of James Rizzis favorite gallery. the city, where he is born 1950 and which inspired him always for new steps. From 1969 – 1974 he graduaded at University of Florida in Gainesville in the class for classic art. During 40 years of his fantastic carrer he developed his own characteristic style. Always colorful, lot of details and rich of stories and figures. Rizzi lived and worked until his death on December 26th in 2011 in his Atelier-Loft in New York, SoHo. 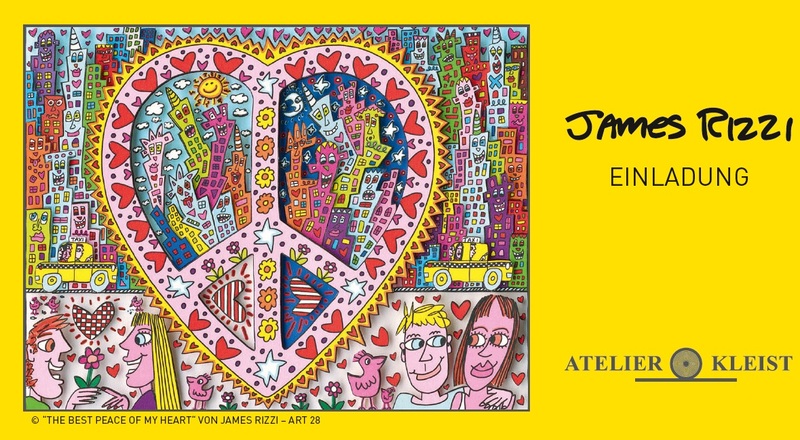 The gallery ARTHUS presents for the first time the international Pop-ART artist James Rizzi from New York in cooperation with the German artist Patrick Preller. For the opening Dr. Friedhelm Häring, Museumsdirektor a.D., Friedberg will present the wonderful art works. On Saturday, 15.11.2014, at 5p.m. all guests are welcome at ARTHUS Galerie ZELL. Three years after James Rizzi died and three years after the last Rizzi exhibition in the gallery Kocken we present you now a fantastic show. It´s time to show all guests and fand the happy, colourful work of the artist. with our huge respect. After Berlin and Mainz the Rizzi wall will now transported to Oberlindhardt in Bavaria. 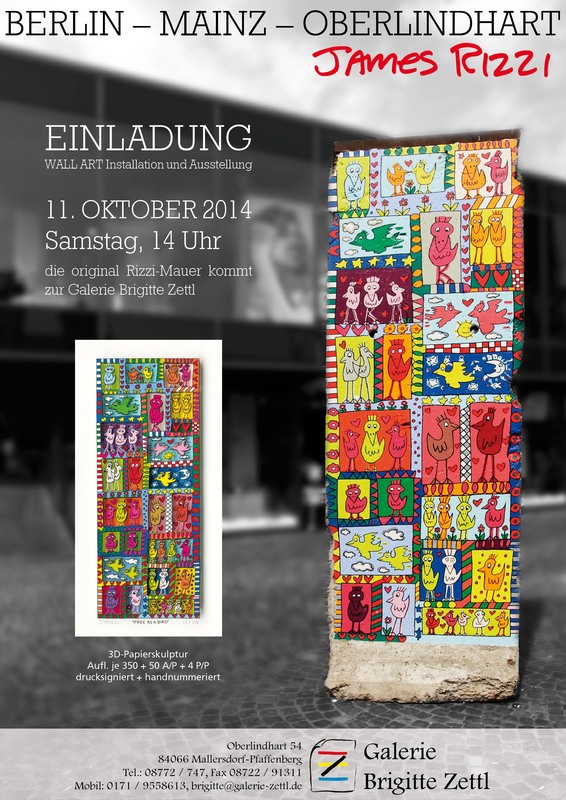 The Gallery Zettl is presenting on a special location the Rizzi Wall on October 11th at 2p.m. During the installation of the wall also new 3D art works of 2014 will be presented in the interior of the gallery. The piece of the Berlin Wall stood since the repainting at the famous Checkpoint Charlie and has been presented during the big Rizzi exhibtion 2014 in the centre of Mainz. Attend the event when the crane installs the wall with its weight of 3,8 tonnes. A 4 meter crane places the wall at the new exhibition space. Beautiful start into the autumn. With colourful art works of the always happy artist James Rizzi the summer athmosphere comes back to Bocholt in September. From September 27th until November 30th the Kunsthandel Koenen ART NETWORK presents in their showroom in the Karolingerstreet 32 in Bocholt not only famous and well known art works. A huge number of new art works in 3D and also very last pieces, before the artist died, can be seen in this show. 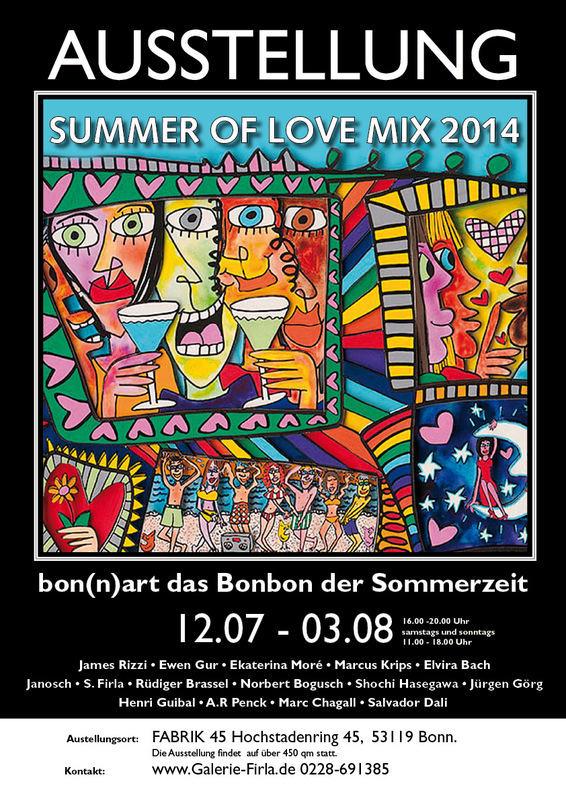 Galerie Firla in Bonn invites you cordially to the annual summer exhibition and opening on july 11th. This year the exhibition will take place in the Fabrik 45/factory 45 at Hochstadenring 45, Bonn. Next to the presentation of the 3D artworks of James Rizzi, there will be original paintings on canvas of the new Street Art Star Ewen Gur. Also the artist Janosch with etchings and originals on paper, as well as art works of Siegfried Firla can be seen in the Fabrik 45. The exhibition runs until 03th of August. Opening on July 11th. 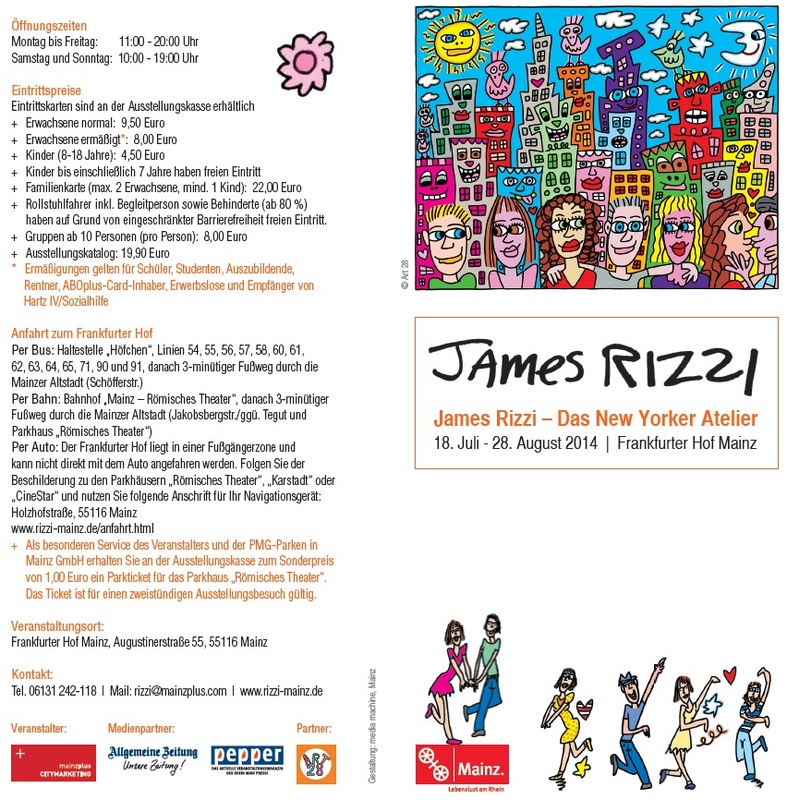 James Rizzi is back: From July 18th until August 28th 2014 more than 500 art works of the estate of the New York Pop Art artist James Rizzi will be shown in the Frankfurter Hof Mainz – some of the art works are shown for the very first time in a public exhibition. This is not the only highlight: Related to the exhibition title, the focus on this retrospective is the private life of the artist, who died in 2011. A modern panorama and original furniture of the Rizzi´s Studio Loft will transmit a very personal impression of Rizzis living and working space in the famous New York district Soho. Some further highlights of the show are last created, as well as incompleted paintings.